To Cite: Liebe R, Krawczyk M, Raszeja-Wyszomirska J, Kruk B, Preis R, et al. Heterozygous Inactivation of the Nuclear Receptor PXR/NR1I2 in a Patient With Anabolic Steroid-Induced Intrahepatic Cholestasis, Hepat Mon. 2016 ; 16(8):e35953. doi: 10.5812/hepatmon.35953. Introduction: The incidence of liver damage due to steroid consumption is increasing due to the omnipresence of the idealized body image and the widespread availability of drugs via the Internet. The genetic factors underlying individual susceptibility are not presently known. Case Presentation: A male patient developed cholestatic liver injury two weeks after a two-month course of anabolic steroids. Next-generation sequencing (NGS) of 24 cholestasis-related genes revealed a heterozygous two-basepair deletion in exon 1 of the pregnane X receptor gene (PXR). Serum bile salt levels showed marked imbalances, strongly resembling the changes observed in patients with biliary obstruction. Conclusions: This case of PXR haploinsufficiency reveals transcriptional regulatory functions activated in the liver under xenobiotic stress by steroids, which appear to require two functional copies of the nuclear receptor gene. Deranged bile salt levels outline the central role of PXR in bile acid synthesis, modification, and export. The use of anabolic androgenic steroids (AAS) to enhance muscle mass is associated with the modern conception of a perfect body. Since the 1990s, the use of steroids for aesthetic and recreational purposes has been increasing rapidly, fueled by widespread over-the-counter availability (1). There are multiple known side effects of anabolic steroid use, particularly testicular atrophy, insomnia, depression, and acne (2, 3). While not a numerically major side effect, steroid-induced liver damage is of concern due to its rapidly rising incidence. A survey from Spain reported an increase in this condition from 1% of total cases of drug-induced liver injury (DILI) registered during the period of 2001–2009 to a prevalence of 8% in 2010 - 2013 (4). A 32-year-old Caucasian male with no significant medical history was admitted with acute cholestasis induced by AAS. Steroid intake extended over two months; however, acute jaundice and pruritus developed only two weeks after termination of AAS. On admission, he was jaundiced, with visible scratch marks all over his body. His VAS score for itching was 9/10. Abdominal examination revealed no organomegaly, and an abdominal ultrasound with Duplex assessment of the hepatic vessels showed no abnormalities. Laboratory tests revealed elevated levels of alanine transaminase (ALT) (153 U/L, normal range 5 - 35 U/L) and aspartate aminotransferase (AST) (58 U/L, normal range 5 - 35 U/L). Alkaline phosphatase (ALP) was 170 U/l (normal range 30 - 120 U/L) and gamma-glutamyl transpeptidase (γ -GT) was 96 U/L (normal range 5 - 35 U/L). Serum bilirubin levels were 27.4 mg/dL. There were no signs of biliary obstruction; other viral or non-viral liver diseases and malignancy were excluded. The patient had received high-dose prednisone treatment before admission to our department. He was treated with ursodeoxycholic acid (UDCA) (15 mg/kg/day) and symptomatically otherwise. His symptoms and liver function tests showed steady improvement, and he was subsequently discharged. The patient attended the outpatient clinic one month after discharge and his bilirubin at that time showed a significant decrease to 10.2 mg/dL. Subsequent clinical re-examination two months later showed complete normalization of aminotransferases, ALP, and γ -GGT. Bilirubin was 1.6 mg/dL. He remains well, with no symptoms related to his liver injury. There is no evidence of a familial predisposition, i.e. no incidents of drug-induced or other hepatopathies in any of his first-degree relatives. Ethical approval for genetic studies of cholestatic patients was obtained from the ethics committee of the Medical University of Warsaw, ensuring compliance of all experiments with the ethical guidelines of the 1975 declaration of Helsinki. Signed informed consent was also procured from the patient. A custom capture assay for 24 genes was purchased from Agilent. Panel genes were selected based on prior knowledge about their roles in cholestatic liver diseases (ATP8B1, ABCB11, ABCB4, NR1H4), cholesterol transport (ABCG5/G8), bile duct development (JAG1, NOTCH2), bilirubin metabolism (UGT1A1-A10, ABCC2), fibrotic liver diseases (CLAUDIN, VIPAR, VPS33B), and metabolism of xenobiotics (NR1I2). Genomic DNA was isolated from EDTA-anticoagulated blood using the membrane-based QIAamp DNA extraction protocol (Qiagen, Hilden, Germany). For sample preparation, the Agilent SureSelectXT Target Enrichment System for Illumina Paired-End sequencing library protocol was used. NGS reactions were performed on an Illumina MiSeq machine. Sequence analysis and generation of variant call files (VCFs) were performed using Illumina software. Further analysis of the detected variants was performed using online tools (www.gene-talk.de), and the read quality, integrity, and abundance of potential disease-associated variants were verified using the Golden Helix genome browser (www.goldenhelix.com). Sequence analysis revealed monoallelic deletion of two basepairs at positions 119501647 and 119501648 of chromosome 3 (human reference sequence GRCh_37). This variant removes the two AG basepairs from codon 15 (arginine) within exon 1 of the PXR/NR1I2 gene (NM_022002.2:c.43_44delAG), resulting in a frameshift and the generation of a stop codon 12 amino acids downstream (R15Sfs*12). This variant was not found in any of the 61,000 Exome sequences in the Exome aggregation database. No other detrimental variants were detected in any of the genes examined. Blood samples for bile acid determination were collected in EDTA tubes. Plasma samples were stored at -80°C until analyses. Bile acid analyses and control populations for serum profiling were described previously by Trottier et al. in 2011 (5-7). The non-cholestatic controls comprised 14 age-matched males (33.8 ± 0.7 years old) randomly selected from participants in the genetics of lipid lowering drugs and diet network (GOLDN) study, who were recruited at the Minnesota fields center (Minneapolis, MN, USA). The biliary obstruction patients (eight men and nine women aged 64.2 ± 10.0 years) were recruited at the Pomeranian Medical University (Szczecin, Poland). Liver biochemistry parameters have been previously reported (5-7) and are briefly summarized in Table 1.
aPlasma bile acid composition and relative induction in a patient with PXR haploinsufficiency and steroid-induced cholestasis, control donors, and patients suffering from biliary obstruction. bBile acid levels are expressed in ng/mL. Analysis of plasma bile acids revealed an impressive 109-fold accumulation of total plasma bile acids relative to the matched controls (Table 1). This accumulation mainly reflects a strong increase of taurine-conjugated acids (Figure 1C), such as taurocholic acid and taurochenodeoxycholic acid (TCA and TCDCA, 784- and 179-fold, respectively) (Table 1), and the respective glycine-conjugated species (Figure 1D), such as glycochenodeoxycholic acid (GCDCA, 48-fold) and glycocholic acid (GCA, 693-fold). Glucuronidated species were increased two-fold (Figure 1E). Due to the excessive accumulation of unconjugated or tauro- and glyco-conjugated bile acid species, the relative abundance of these highly hydrophilic glucuronidated acids was drastically reduced (< 0.1% versus 12.8% in controls) in the PXRdel sample (Figure 1F). Interestingly, the concentration of unconjugated acids showed a similar profile, since the plasma sample from the index patient demonstrated a 12.5-fold lower level than the controls (Figure 1B). The most intriguing observation relates to secondary and 6α-hydroxylated acids, namely hyodeoxycholic acid (HDCA) and hyocholic acid (HCA), which are absent from the PXRdel plasma (Table 1), as are the unconjugated forms of the secondary bile acids LCA and deoxycholic acid (DCA). Interestingly, and with the exception of HDCA-24G, the glucuronidated forms of LCA, HDCA, and HCA were detected in the patient sample (Table 1), indicating that the low level of 6α-hydroxylated bile acids may sustain efficient glucuronide conjugation. Furthermore, with the exceptions of taurodeoxycholic acid (TDCA) and lithocholic acid-sulfate (LCA-S), which are detected at levels similar to those in the control samples, PXRdel plasma exhibited lower contents in glycodeoxycholic acid (GDCA), taurolithocholic acid (TLCA), and glycolithocholic acid (GLCA) (Table 1). Interestingly, the bile acid profile of this patient closely resembles that observed in people with severely impaired biliary secretion (7). 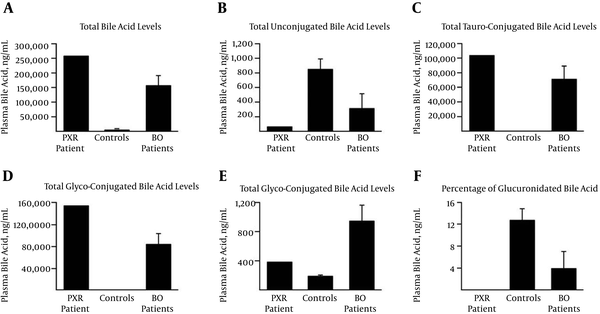 This observation suggests that the combination of PXR haploinsufficiency and AAS severely reduced the feedback regulation of bile secretion in our patient, causing the observed massive accumulation of taurine- and glycine-conjugated primary bile acids. This accumulation was likely to be causal in the degradation of this patient’s liver function. The absence of secondary bile acids, such as DCA and LCA, in the PXRdel plasma is consistent with impaired biliary secretion since these are formed through bacterial transformation of primary bile acids in the intestine. Nevertheless, the 112.5-fold accumulation of LCA-3G suggests that the low level of hepatic LCA may sustain strong glucuronidation reactions. The same applies to HDCA and HCA, which are absent in their unconjugated forms, while being detected as 6- and/or 24-glucuronide species. A, Total bile acids: sum of all 18 species; B-E, the sums of unconjugated; B, tauro- ; C, glycol-; D, and glucuronide conjugates; E, were calculated by adding the concentrations of conjugated CDCA, CA, DCA, LCA, UDCA, HDCA, and/or HCA; F, the relative abundance of glucuronide conjugates was calculated as the ratio of total BA-G to total BA + total BA-G, and is expressed as a percentage. The need for improved genotype-phenotype correlation in cases of idiopathic or drug-induced liver damage is urgent. Due to the ubiquitous availability of various performance-enhancing drug preparations (8) combined with an aging and highly-medicated population, we expect to encounter this type of affliction at an increasing frequency in the future. In the present case, haploinsufficiency of the PXR gene, a central regulator of CYP3A-mediated xenobiotic metabolism, was unmasked two weeks after chronic consumption of anabolic steroids for two months. In a recent report of genetic variants in ABCB11 and ATP8B1 in two patients with AAS-induced cholestasis, symptoms of liver damage only appeared four and seven weeks after termination of drug consumption (9). The lack of genome-wide association study signals for DILI other than the known major histocompatibility complex risk alleles supports the concept that strong genetic determinants of DILI may be largely drug-specific and reflect rare genetic variations. Our results pinpoint the genetic predisposition toward developing cholestasis after the use of AAS, and further NGS-based studies are encouraged to determine the full spectrum of private mutations in nuclear receptor genes that increase the risk of DILI. Authors’ Contribution: Piotr Milkiewicz diagnosed and recruited the patient; Roman Liebe and Frank Lammert designed the sequencing panel; Rebecca Preis performed the sequencing reactions; Jocelyn Trottier performed the bile acid profiling; Olivier Barbier supervised the bile acid profiling; Roman Liebe, Marcin Krawczyk, Joanna Raszeja-Wyszomirska, Olivier Barbier, Piotr Milkiewicz, and Frank Lammert analyzed the data; Roman Liebe and Marcin Krawczyk drafted the manuscript, which was edited by Piotr Milkiewicz and Frank Lammert; Frank Lammert supervised the project. Roman Liebe had full access to all the data in the study and takes responsibility for the integrity of the data and the accuracy of the data analysis. Funding/Support: This study received support from the national science center of Poland (Grant 2011/02/NZ5/00321), the Canadian foundation for innovation (CFI, grant#10469), the Canadian liver foundation, and the HOMFOR program of Saarland university.